The SoyaCow machine is capable of making three gallons of soya milk in 30 minutes from 1.7 kg. of raw soybeans. The technology was developed by ProSoya Foods Ltd., a group of Ottawa scientists and entrepreneurs. 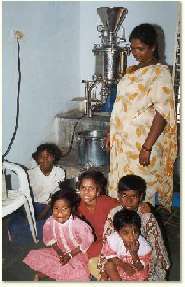 The SoyaCow machine is used in Child Haven homes to produce Soya milk and Soya products for the children. It's also sold to economically disadvantaged women for their use as a cottage industry. In 1988 a SoyaCow Support Group was formed and by 1992 Child Haven International had purchased six SoyaCow machines. Child Haven received funding for this environmentally friendly project from The Canadian International Development Agency (CIDA). There are now 400 SoyaCow machines in India and it is being promoted in Africa. Charitable donations and fundraising events provided Child Haven's contribution to the promotion of the SoyaCow. SoyaCow technology produces a palatable, highly nutritious, cereal or almond flavoured milk without cholesterol. The milk and okara mash can then be used to produce other soya products such as yogurt, tofu and vada. One machine can produce sixteen-three gallon batches in an eight hour day - equivalent of a herd of 16 cows in India. SoyaCow machines are used in Child Haven homes in Kathmandu, Bangladesh, Hyderabad and Kaliyampoondi because soy milk is low cost, high protein product which is cheaper to produce than cow's milk. From a given acreage, ten times as much soy milk can be produced at one third to one half the price of cow's milk. Soy milk made on the premises of schools and homes is safe from contamination by dilution with water. It is also free from the danger of transmitting tuberculosis or other diseases from infected cows. In addition to the health benefits of soya milk, Child Haven's SoyaCow Project has generated employment for women. These women are trained to operate the SoyaCow machines and sell the soya milk products, thereby achieving some economic self sufficiency and generating revenue which can be used for the benefit of their children. 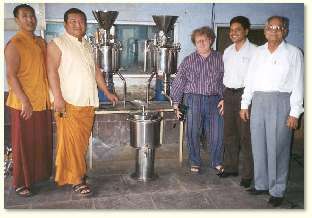 Mt Bannerjee, right, of SSP Company in Faridabad is selling a SoyaCow to Rinpoche Dakpa, second from left. Also present are volunteer, James Douglas and Dr Ratan Sharma, child Haven's SoyaCow expert. The Rinpoche needs a SoyaCow for a large Tibetan Buddhist monastery in Bangalore. 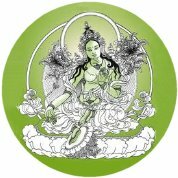 The Rinpoche told us that His Holiness the Dalai Lama recommended to the monks and lamas that they become vegetarians for reasons of compassion and better health. Child Haven, together with ProSoya of Ottawa, transferred the SoyaCow technology to India some years ago.